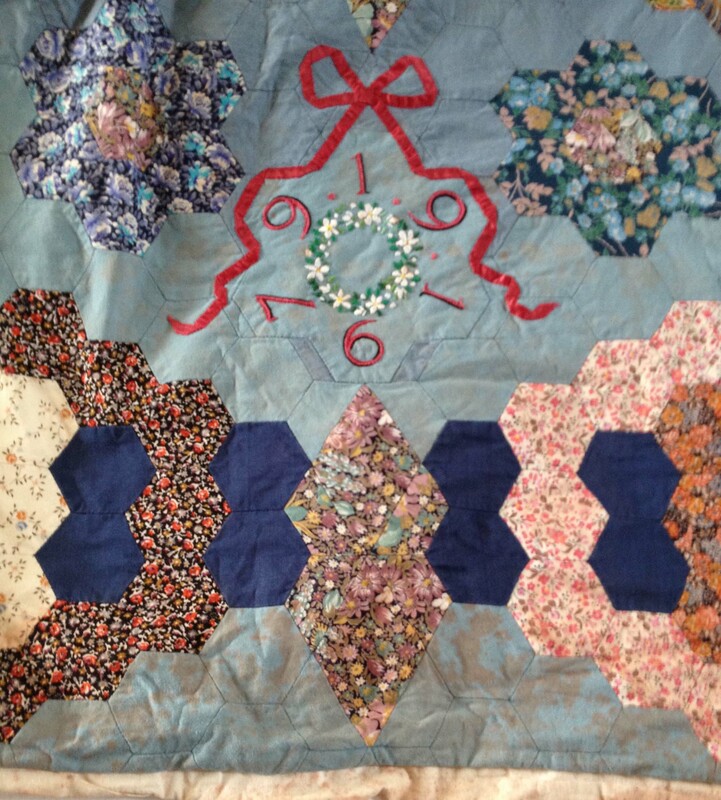 Recently I wrote about my story quilt, and the fabrics I had chosen to include and their family associations. It got me thinking. I started looking around at all the textiles lying about the house, and thinking about the people who had sewed or knitted them. I was amazed to find so many treasures that family members had made. 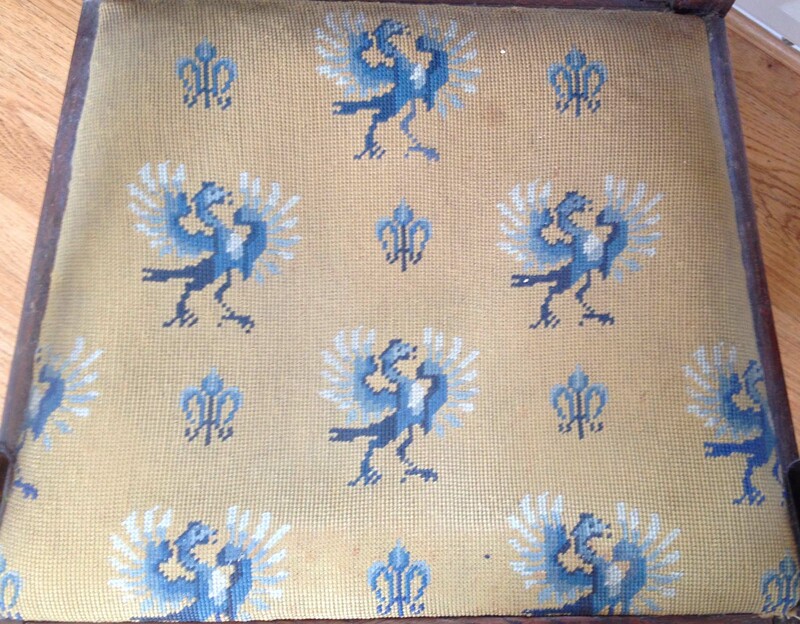 Let’s start with the needlecase that my step-great-grandmother made. Great-Gran lived in Miss Havisham-esque magnificence in her bedroom in a huge house in Leicester. She took to her bed in early old age in the belief that her heart was weak, and she was waited on hand and foot by her family and a saintly elderly retainer, Miss Wood. All around her bedroom were cupboards and boxes, filled with beads, silks, threads and other treasures. If I was lucky (and a good girl) she would give me some beads or silks from her treasure trove. Great-Gran’s workmanship was exquisite. Here is the needlecase she made me. I still use it everyday, and look at her skilled stitches and remember her bedroom. It’s worth enlarging this image to see her detailed work – there’s beading along the edge. Her son, my step-grandfather was also extraordinarily skilled at – well, just about everything. He repaired clocks, made jewelry – and was a successful and busy business man to boot. He also did tapestries. This is one of a set of chair covers he embroidered. A very stylish simple design which regularly gives me great pleasure. (And – sadly – he predeceased his mother, tucked up in bed with her so-called heart problems). His wife, my Australian grandmother Dordy (she didn’t want to be known by any ageing grandmotherly term, so we grandchildren gave a family twist to her first name, Dora), was also a fine sempstress. She never did any “hobby” sewing that I know of, but she made almost all her own clothes. Perhaps there’d been greater necessity for practical sewing in the world she’d grown up in – I don’t know. She loved to wear batik fabrics which suited her colouring very well. 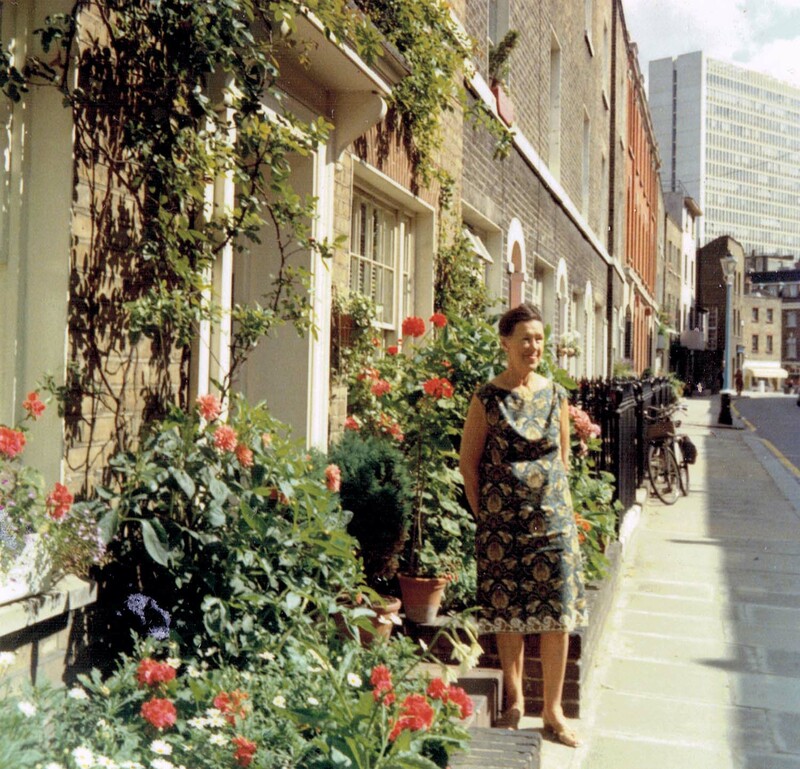 Here she is outside her little London home with it’s beautiful garden wearing one of her handmade batik dresses. Many, many of her clothes came to me, and I wore them (usually cut down and altered into shapes I considered more fashionable). The dress Dordy is wearing above is now in my story quilt (of which I have written more here). Look below! 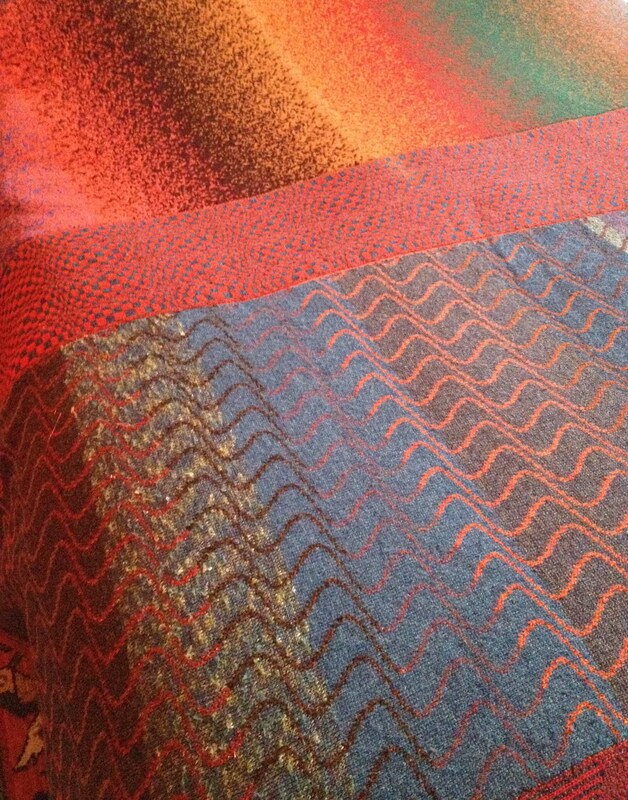 My father, (Dordy’s son) took to tapestry like his step-father. The best of his embroidered cushions are masterpieces of design, incorporating words and phrases in many languages. (He had been a linguist, a traveller and a diplomat). 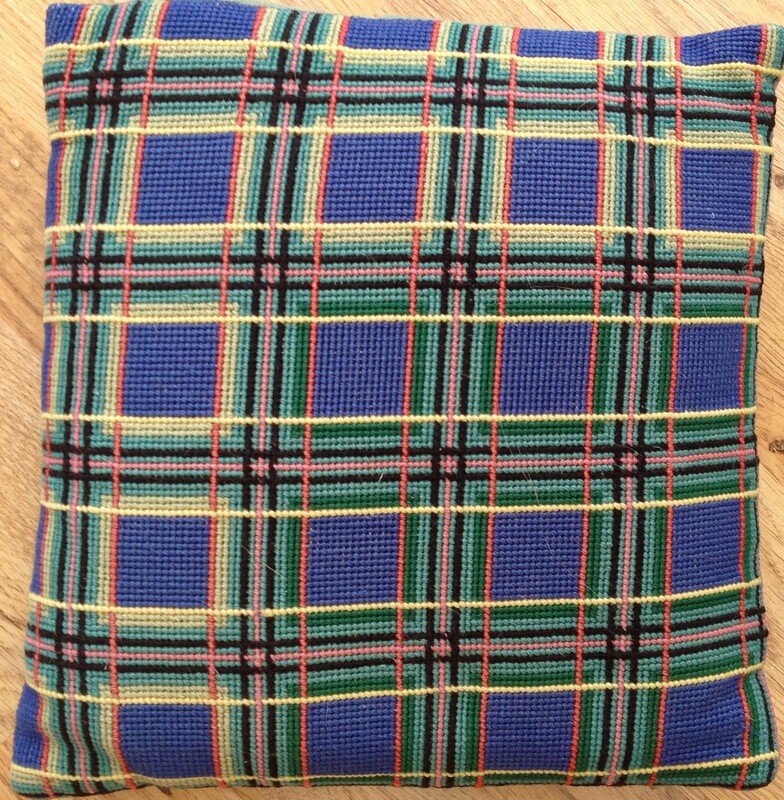 I treasure this cushion particularly. Apparently the Japanese characters say “Good Health. No smoking.” (I can’t verify that!) 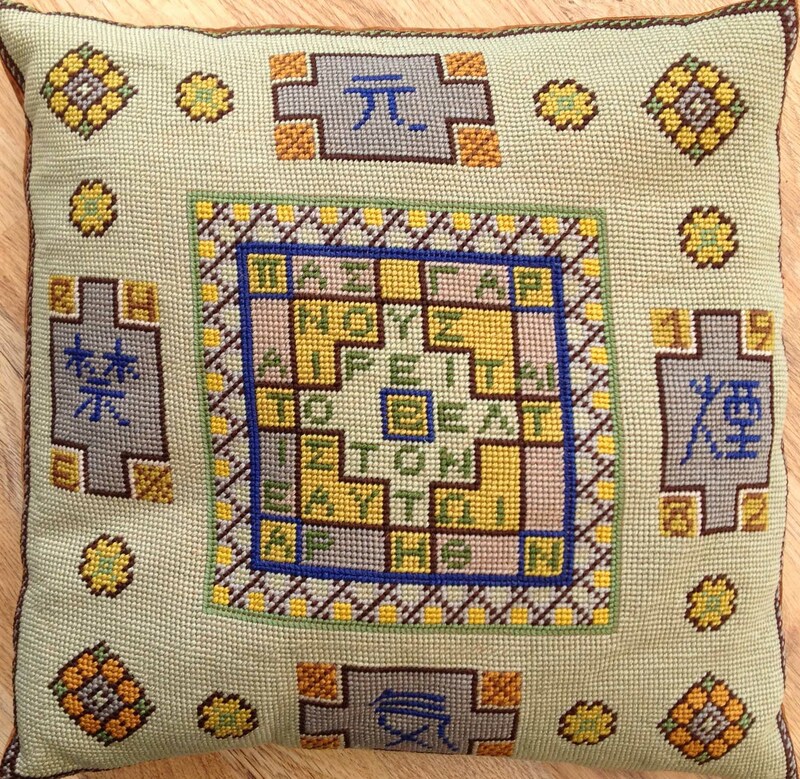 A rough translation of the ancient Greek at the centre might be: “For each person chooses best for themself.” The cushion was a gift from my father to mark the occasion of my giving up smoking. He’s put his initials round the motif on the left, RHE, and the date on the right, 1982. An important and precious reminder to me. None of the men on my mother’s side of the family sewed, but her mother did. 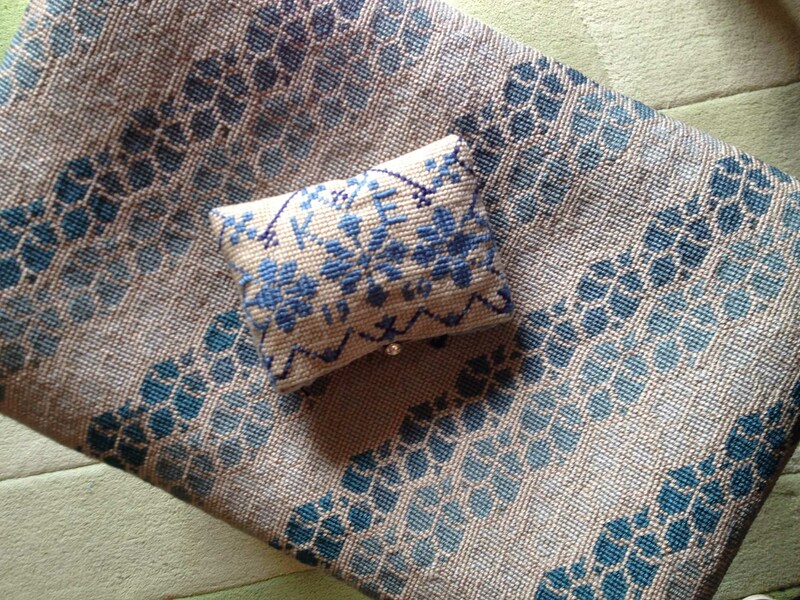 Granny was another embroiderer, and her chosen colour was blue. She worked the cover of this stool, and this little bag for me. It’s got my initials on it (KE) and the date (1960). My Aunty Jilly (her daughter) was a talented weaver. 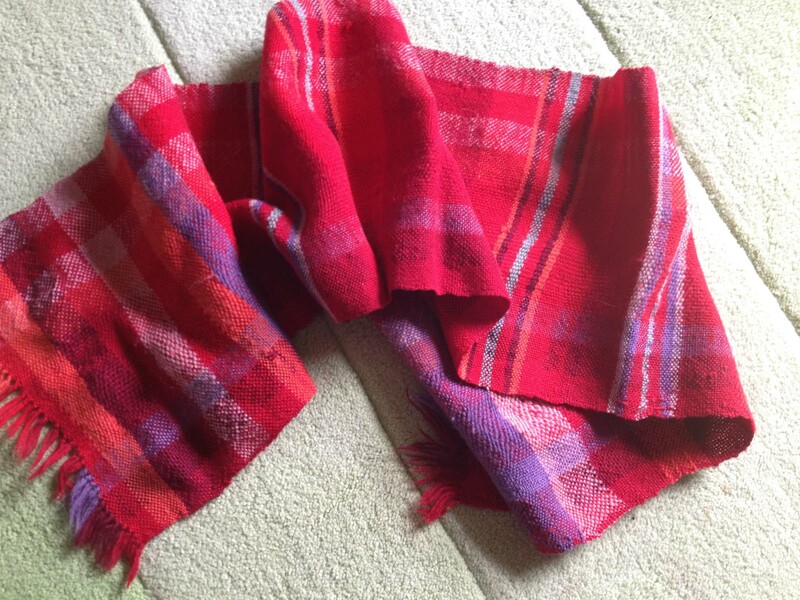 I treasure this scarf she wove with it’s red and purple pink tones – and the occasional shot of turquoise to give it lift. Her use of colour is brilliant – she always gets it just right. My mother is a sempstress par excellence! She made many of our clothes when we were little. Here we all are, in a symphony of blue (her favourite colour like her mother), at my youngest sister’s christening in the hot hot 1961 Belgrade sun. I’m the eldest on the left, and my sister, Marian, is on the right. My mother has made us the most enchanting hand-smocked blue and white cotton dresses. Her dress is also blue – a paler colour. 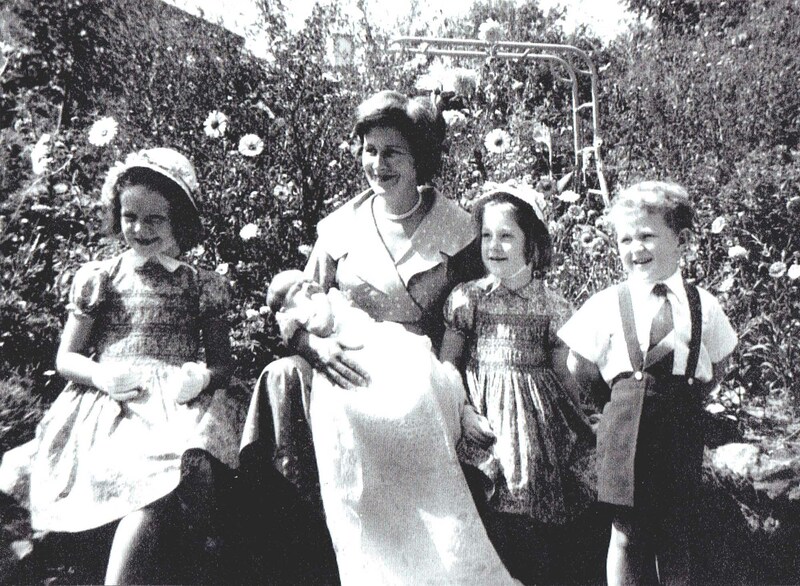 Don’t we look an delightful family, with these beautifully dressed children (I see we’re even wearing gloves!)? How extraordinarily photos can conceal the truth – my mother’s heart must have been breaking amidst all the happiness because just a year before she’d given birth to a still-born baby. I don’t remember at 7 being aware of this – just the heat and the cosmos and sunflowers growing exuberantly. My mother also knits, embroiders and does patchwork. It’s really hard to chose what to chose to show that captures her skills best but I think I have to include a patchwork quilt. 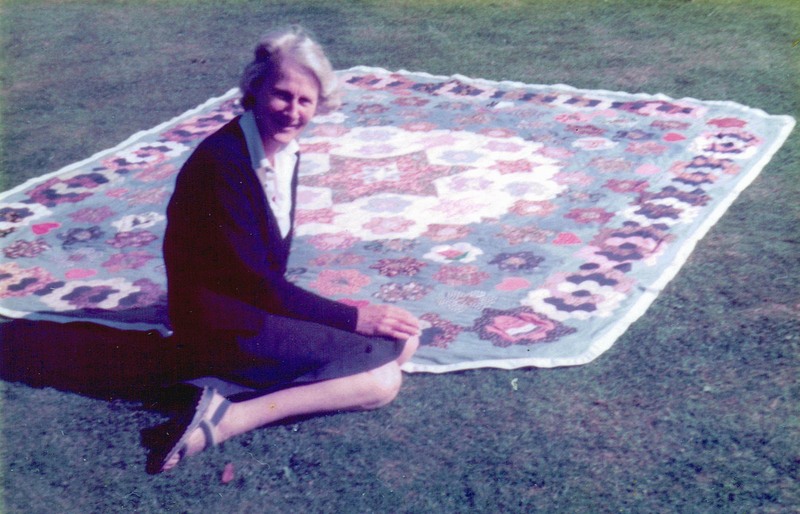 Here she is, sitting beside the patchwork quilt she made with my mother-in-law, Liza, for my 1979 marriage to Hugh. 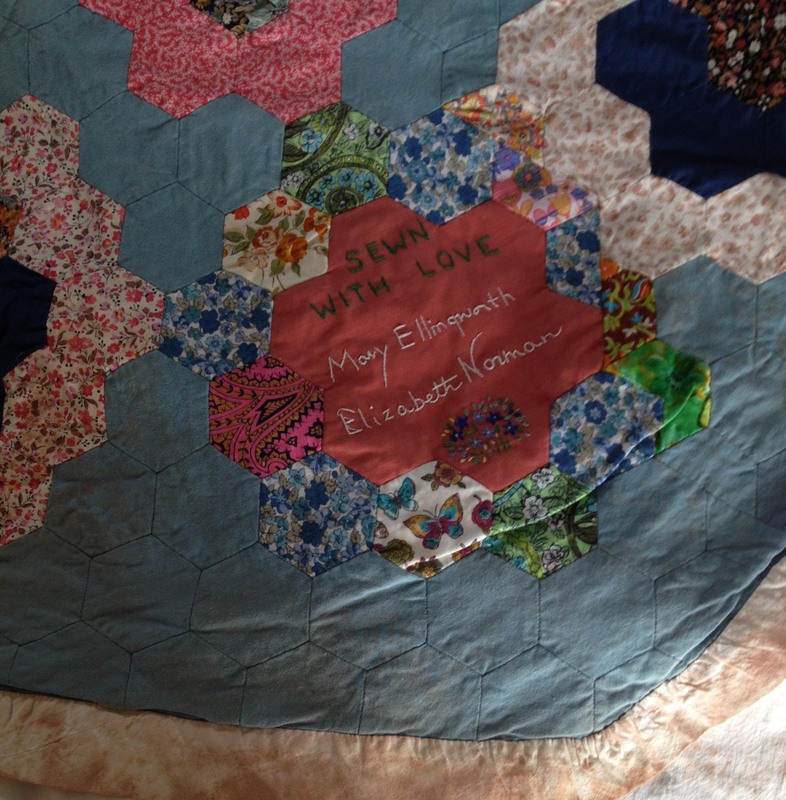 My mother designed the quilt, and sewed the patchwork. Liza was an artist and embroiderer, and added names and dates, and some delightful little embroidery stories. 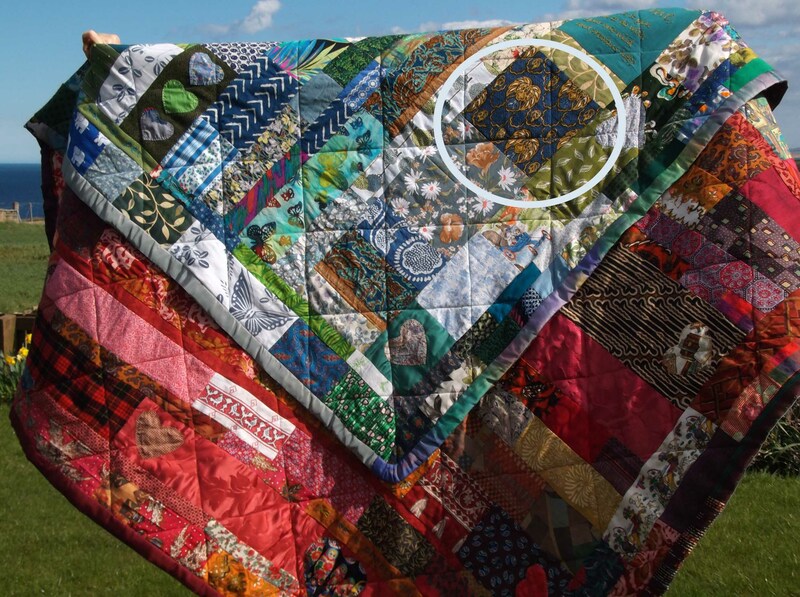 Aaaggh – this quilt evokes so much pain and guilt in me! So much care, so much love, so much skill, and what did Hugh and I do but get acrimoniously divorced! I know it is ridiculous, but the quilt sums up all my sense of failure at our divorce. So what do you do when your marriage has fallen apart, and you have this beautiful beautiful quilt, made specially for you, and relevant only to you? Well, you put it in the attic, which you know to be a nice dry place because you keep lots of other old fabrics and children’s clothes etc up there. You put it in it’s own suitcase, which you know is clean and safe – and you forget about it. Your mother never mentions the quilt again. Then, one day, there’s a patchwork exhibition locally, and you think – wouldn’t that just be the right place to put this patchwork quilt, so it could be exhibited and admired as its due? You hasten to the attic, get down the suitcase, and absolute horror of horror, the suitcase has “wept” red-brown stain (as I have never known a suitcase do before) all over your quilt. Aaaagh again – and again, and again. * And, no, I have never told my mother what happened to the beautiful quilt she and Liza made with so much love and hope for my first marriage. Let’s move on to later times, other generations. My husband, Stephen, is an absolutely whizz with the knitting machine. It suits him so well, giving his mathematical mind full scope for the design of elaborate and beautiful patterns. Here is the blanket he made for us. These are all patterns he devised himself – that’s something I could never do, so I am completely in awe of this skill. 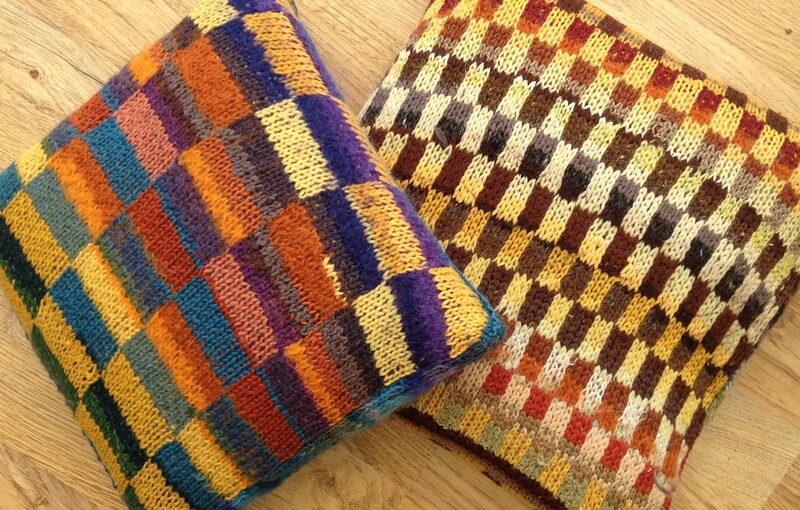 Then there’s these gorgeous cushions that my cousin, Lucy, knitted for me. Vibrant strong colours and patterns. 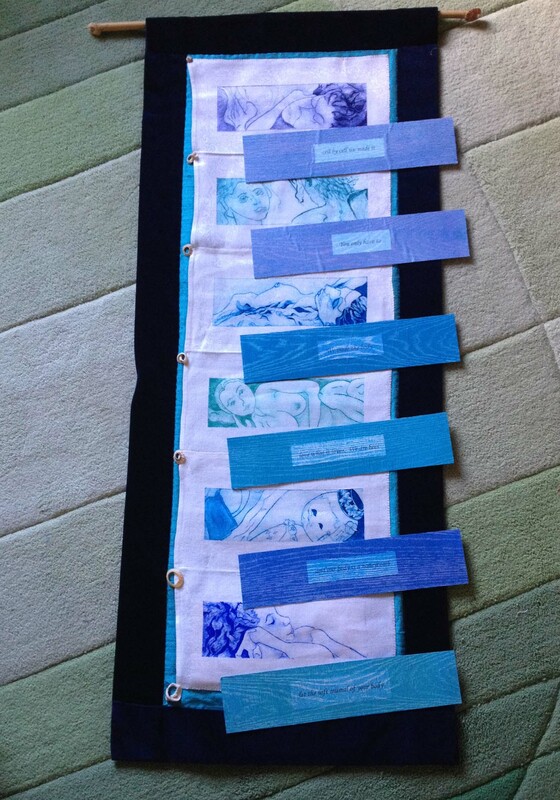 This beautiful wall-hanging that another cousin, Polly, designed and worked. There’s calligraphy and stitchery and printing all combined into one marvellous work. Last Christmas, my step-daughter, Zacyntha, embroidered this cushion cover for me. Incredible use of colours and design. Each time you look at it, the patterns shift and it looks different. 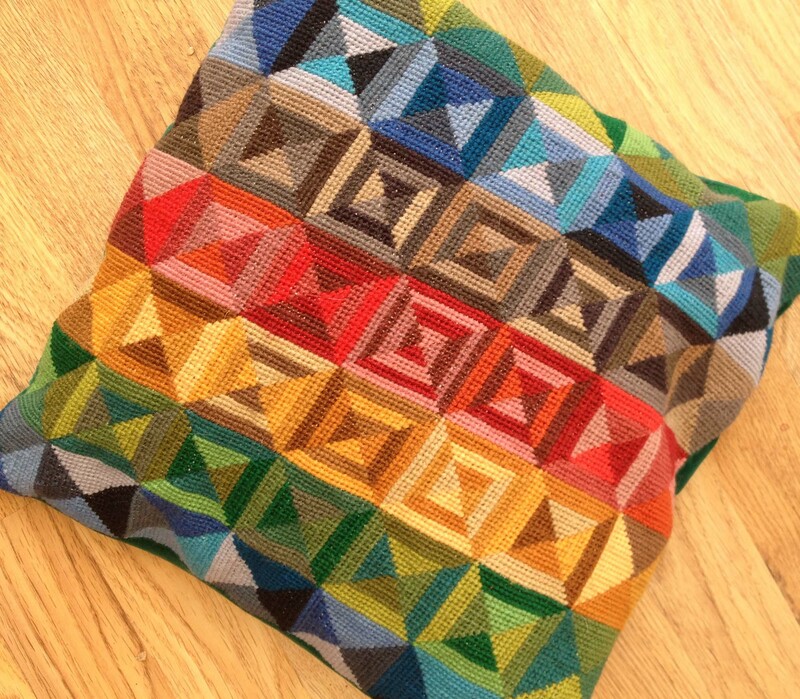 Another step-daughter, Lorna, also designed and made us a cushion cover. I think this was part of her A-level Art project. I love it – particularly how the colour changes just slightly where she’s run out of a yarn. Just like the carpet weavers of old. Then there’s this wonderful box that my daughter, Helen made. 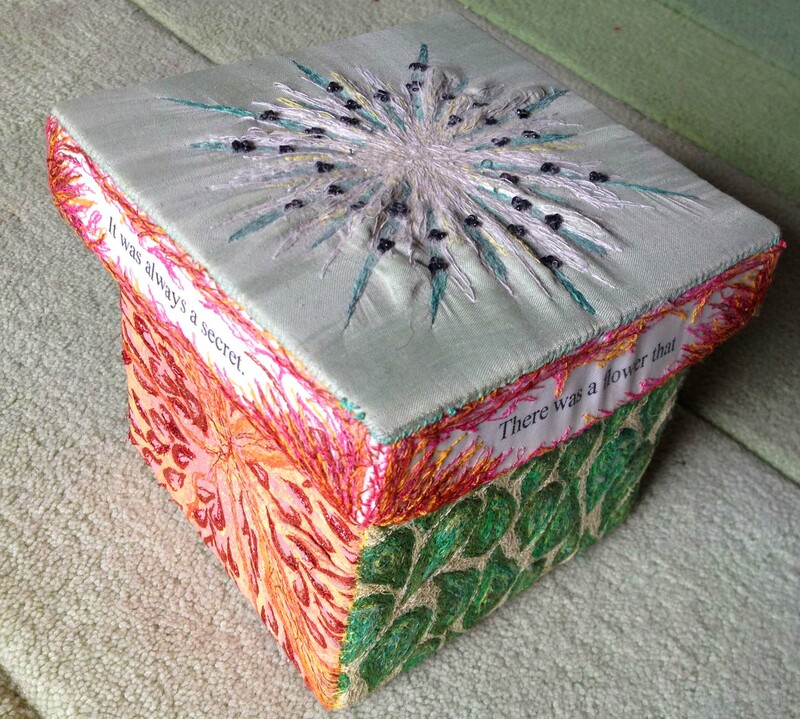 It’s another A-level Art project – she constructed the box, and the fabrics that adorn it are machine and hand-embroidered. Naughty, naughty mum left it in the sun so the top is much bleached. It’s still a treasure. It was always a secret….. So many precious things, so much love, so many memories – so much inspiration!